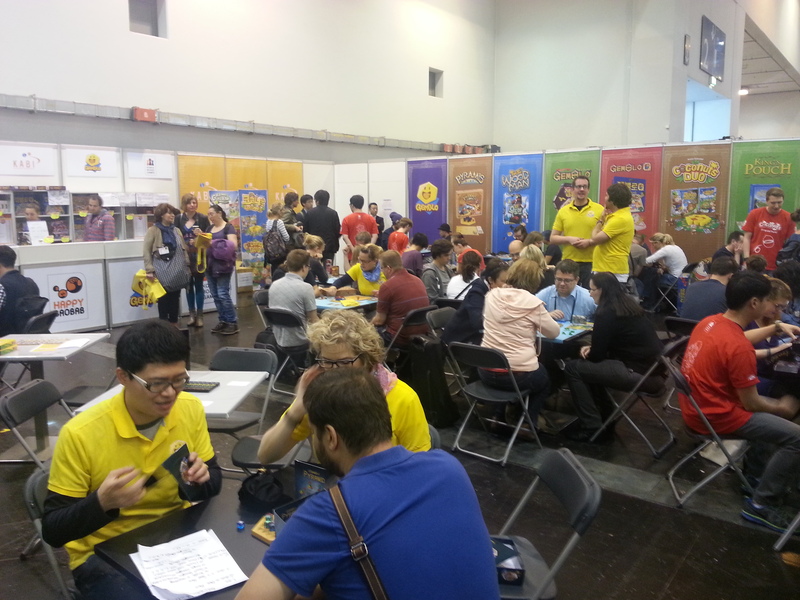 2 weeks ago was the first day of Spiel fair 2014 in Essen, Germany. And what a successful first day it was. We almost sold out in 4 of our 5 novelties and they were sold out at the end of the fair. Many people wanted to play a game of Abraca..What? and King’s Pouch and the tables were always full with people coming together and playing our games. It was a exciting time. 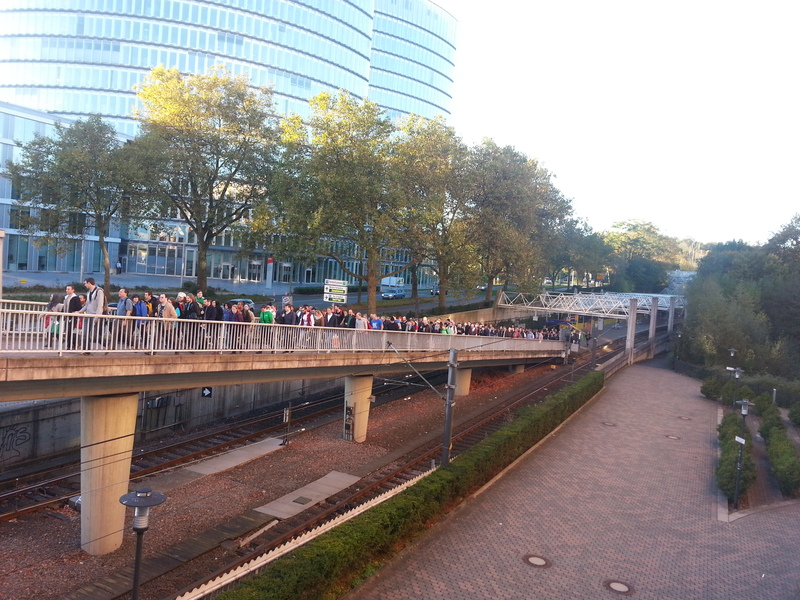 Each year, many games get released in these mad days in Essen. Each year there is a lot of excitement in the fair halls when the games for which you read everything you could gather and got excited for a long time finally gets avaiable for everybody. 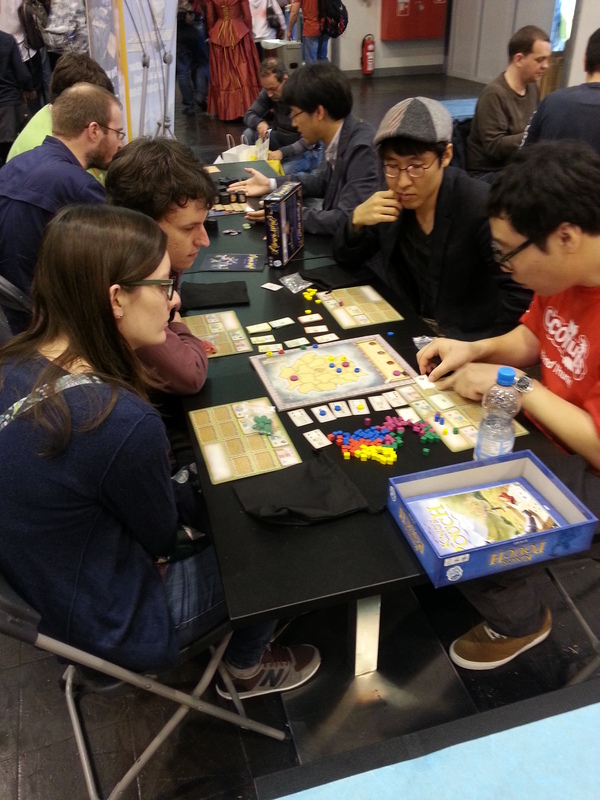 We had a lot of such encounters and met many great people who wanted to play our games. Because this is really what Essen is about: meeting people. Meeting partners for possible distribution in other countries, meeting shop owners, board game artists and journalists, meeting board game designers and getting to know their interesting new designs and last but not least meeting fans who want to play our games. You all are the reasons why we love to make games. Playing King’s Pouch with the designer Keewong Kim. 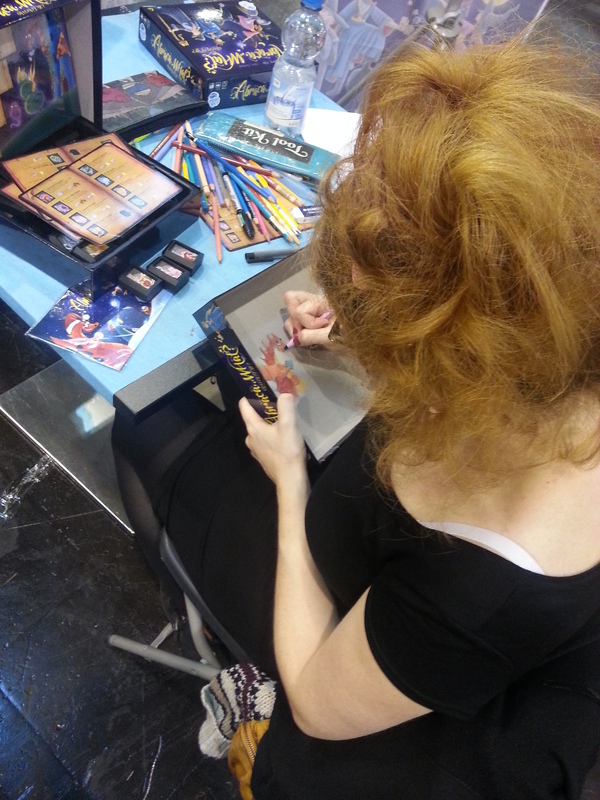 Marie Cardouat signing a copy of Abraca…what? 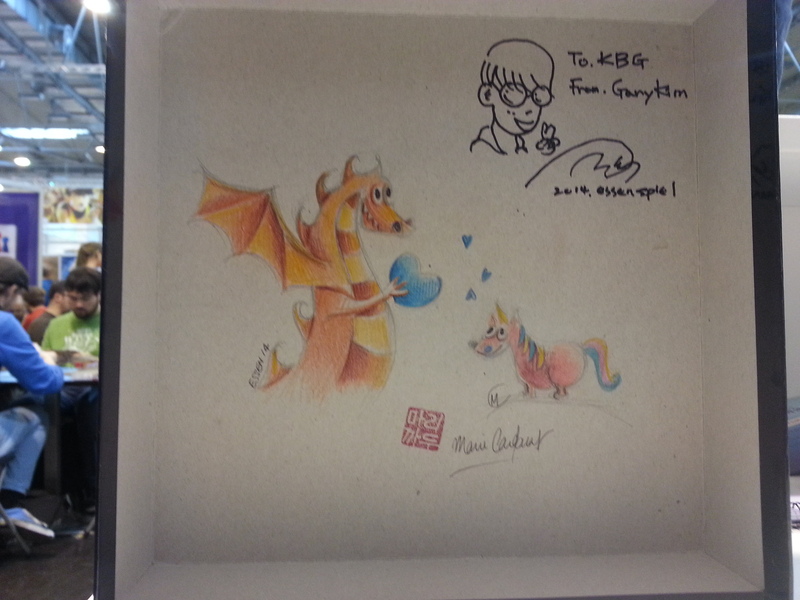 We had a very fun time this year in Essen and hope to see all of you again next year! We’ll take a break from the KBG Design Contest News this time and tell you about another way to interact with authors. A fair! Göttingen is the name of a town in northern Germany. For more than 30 years it has also been the location of a boardgame authors’ fair. Many of the big german publishers, like Amigo, Ravensburger, Kosmos, etc. are sending scouts to authors’ meetings like this and “Göttingen” is one of the oldest and most famous of them. The latest fair took place this past weekend (14th and 15th of June). For us as scouts, the fair in Göttingen always provides very mixed experiences and it was not different in this year. Even if you are a veteran editor… you played this game only one time, while the author has worked on it for months or years! OK, maybe you are sitting in front of a rethemed version of “chutes and ladders”… but it is probably still better to hold back and respect the time and effort the guy on the other side of the table has put in. And anyways you don’t have time for any “small talk” because there are 199 other tables to go to! Going through all those tables while keeping an open mind and listening to every explanation attentively all the time is nigh impossible, so in addition to all other problems, one has to be aware of these limitations and try to work around them. All the “stress” of trying to do your job aside, there are also a lot of positives: you can find all kinds of different people at the tables there, ranging from experienced authors to total newcomers and from game agencies to authors’ collectives. Most of the people -even those who participate the first time- usually are well-prepared and know what helps the scouts to do their jobs (summary sheets for games, name cards with contact info, etc.). Everyone is generally friendly and the atmosphere is quite relaxed. And of course it is great fun to see what sometimes incredibly complicated, sometimes stupidly funny, sometimes genuinely surpising and novel ideas all those people are showing. So we will definitely be there again in 2015.